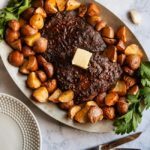 This easy roasted southwestern steak paired with roasted baby potatoes makes a hearty, comforting meal. With this recipe you can enjoy steak any time of the year. In a small bowl, mash together garlic and salt with the back of a fork. Mix in the spices. Stir in olive oil gradually and blend until a thick paste forms. Rub paste over all sides of steak. Cover steak and let marinate in the refrigerator for 2-12 hours. Preheat oven to 425. Cook covered for 20-30 minutes, depending on desired amount of doneness. Quarter the potatoes and put them in a bowl. Add olive oil, pressed garlic, smoked paprika and salt and pepper. Toss together. Spread on a baking sheet lined with aluminum foil and bake at 425 for 30 minutes or until fork tender, flipping potatoes once midway through.